Leading M/CFE excavation specialist, James Fisher Subsea Excavation (JFSE), has launched the innovative new MultiROV system to satisfy additional client requirements. 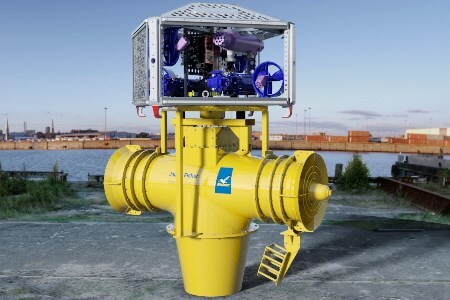 The MultiROV brings new levels of controllability and productivity for excavation requirements in the offshore oil and gas and renewable energy sectors. It reduces the services required from a vessel as it needs no stabilising tuggers or clump weights. Onboard thrusters allow movement and heading control which increase the operational window and productivity. The system’s configuration means it can be deployed in water depths in excess of 3000 m bringing the benefits of mass/controlled flow excavation (M/CFE) to the deepwater market. The system as standard also has the data hosting ability to run a multitude of survey sensors meaning there are flexible options for the real time data that can be captured during operation. Additional capabilities of the MultiROV allow for the deployment and use of multiple other subsea tooling including shears, cutters and grabs. JFSE’s fleet of tools provides a non-contact form of excavation that eliminates the risks associated with other excavation methods, especially around complex subsea assets. Further enhancing their capabilities, the tools have the additional benefit of real time sonar imaging which enables precision excavation in confined areas, as well as for all cable or pipeline trenching works with diameters from 1 in. to more than 60 in. scopes. The tools are used for applications including pipeline and cable trenching, deburial, rock dump dispersal and seabed clearance and preparations. The M/CFE spreads are ideal for moving materials such as sand, silt and mud, drill cuttings, clay and rock dump.